Red yeast rice (Hong Qu) is a substance made by fermenting a type of red yeast called Monascus purpureus over rice. The use of red yeast rice in China was first documented in the Tang Dynasty in 800 A.D. A detailed description of its manufacture is found in the ancient Chinese pharmacopoeia, Ben Cao Gang Mu-Dan Shi Bu Yi, published during the Ming Dynasty (1368-1644). In this text, red yeast rice is proposed to be a mild aid for gastric problems (indigestion, diarrhea), blood circulation and spleen and stomach health. 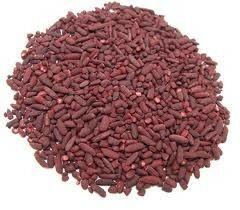 Red yeast rice is also used as a preservative, spice, and food coloring. It's used to give Peking duck its characteristic red color and can also be an ingredient in fish sauce, fish paste, and rice wine. 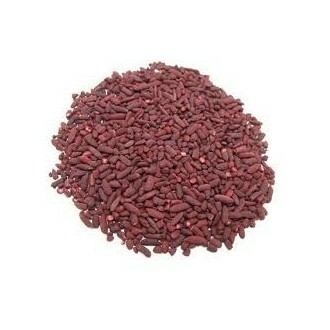 Red yeast rice contains naturally-occurring substances called monacolins. Monocolins, are converted in the body to a substance that inhibits HMG-CoA reductase, an enzyme that triggers cholesterol production. Since the 1970s, human studies have reported that red yeast lowers blood levels of total cholesterol, low-density lipoprotein/LDL ("bad cholesterol"), and triglyceride levels. There's been very little scientific examination of red yeast rice in the United States, however, a landmark American study was completed at UCLA after 17 studies in China declared that red yeast rice lowered cholesterol by 11 to 32 percent. The most popular and effective prescription drugs for elevated cholesterol, Lipitor and Zocor, also known as "statin drugs," work much in the same way as red yeast rice, by inhibiting a key liver enzyme from producing cholesterol. When the FDA discovered that red yeast rice contained lovastatin, a substance found in prescription drugs, it banned red yeast rice products containing lovastatin. In August, 2007, the FDA issued a warning that several red yeast rice products still contained lovastatin. At this time, red yeast rice is classified as a dietary supplement by the FDA. There is an ongoing legal debate about whether red yeast rice should be reclassified as a prescription drug rather than a dietary supplement.